Some patients have gone years without a diagnosis, but the director of Emory Clinic's Special Diagnostic Services is a determined sleuth. By the time Sam Barfield and his wife, Barbara, walk into the clinic at Emory University, they are weary of medical waiting rooms. Ignoring a soothing view of the Japanese garden outside, Barfield sits where he can stare down the hallway to glimpse the nurse as soon as she appears. Barfield wears a jacket despite the warmth of early fall and slouches in his chair. The 63-year-old is achy and exhausted—not just tired but sapped of life by a flu-like fever that has lasted three months. A fever that doesn’t respond to Tylenol or aspirin or anything else. A fever that rises each afternoon with a wave of heat, causes him to soak the sheets with sweat each night, then chills him to the bone. It is a mystery fever that 14 doctors have failed to diagnose. Now, as he waits for the 15th doctor, he allows himself a novel sensation: a flutter of hope. 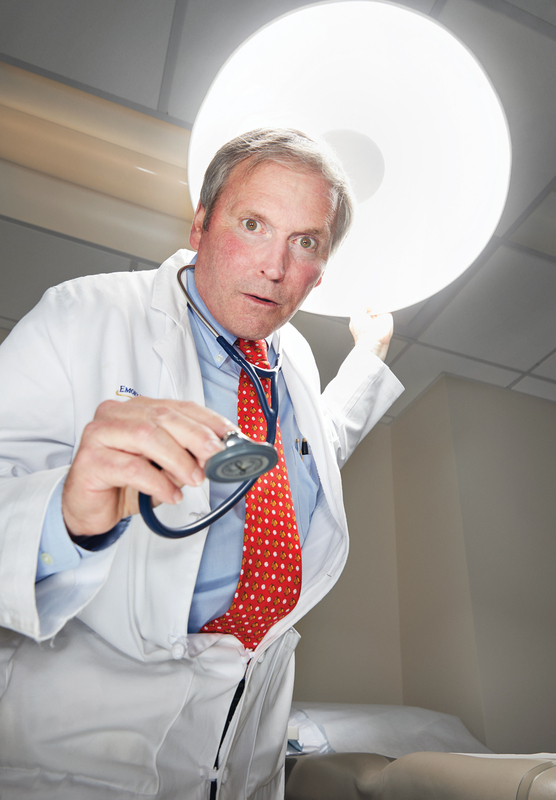 A visit to Dr. W. Clyde Partin Jr., director of Emory Clinic’s Special Diagnostic Services, is like seeing a kinder, gentler version of Dr. Gregory House, the brilliant but irascible television doctor. House walks with a limp, pops Vicodin, and insults patients and colleagues alike before suddenly pronouncing an elusive diagnosis. Partin identifies more with another fictional protagonist, Sherlock Holmes. His investigations take a quiet, methodical approach. At 62, Partin still has a boyish face, and he speaks with a soft voice that makes you lean in to listen closely. If it is baseball season, he’s apt to wear a bright red tie emblazoned with mitts and baseballs. His colleagues describe him as unflappable. “He can sift through the confusion of emotion, fear, and anxiety and see through to the diagnosis,” says Dr. David Roberts, director of Emory’s Paul W. Seavey Comprehensive Internal Medicine Clinic and a member of Partin’s special diagnostic team. Unlike his television counterpart, Partin, an internist, has always enjoyed interacting with patients. Most of them have the textbook symptoms of the modern age: high blood pressure, high cholesterol, elevated blood sugar. And when Emory created the Special Diagnostic Services clinic in 2013, Partin welcomed the luxury of time to delve into the medical equivalent of cold cases. Medicine, like detective work, requires deductive reasoning. By the time Partin steps into the exam room to see Barfield, he has already begun to think of possible causes. He has read all 728 pages of Barfield’s six-inch-thick medical record. Barfield is a sturdy, retired AT&T safety manager from Acworth who, before this ordeal, had an easy smile and a passion for many hobbies. Previous doctors speculated that he might be experiencing an adverse side effect to a medication, a rare infection, an autoimmune disorder, or even cancer. He has taken partial courses of four different antibiotics and undergone a spinal tap, full body scan, chest x-ray, echocardiogram of the heart, and dozens of blood tests. But in the end, there was only the fever. “Tell me what brought you here today.” Partin opens every exam with the same prompt, even when he knows the answer. “Tell me about the birds.” Barfield raises white homing pigeons, and Partin wants to know how he handles them. Barfield admits he isn’t very hygienic when he feeds the birds, cleans their pen, or gently holds them for his two-year-old grandson, Henry, to touch. Seventeen birds leave a lot of droppings. He doesn’t wear gloves or a mask. Birds carry diseases that can be transmitted to people, so Partin makes a note to check for psittacosis and Cryptococcus. No other doctor has probed so deeply into Barfield’s daily life. The outdoorsman is also a disc golfer and former geocacher who has been bitten by ticks dozens of times. Partin will look for Lyme disease and rickettsia. But the blood tests all come back negative. Dr. House saves a life in most 44-minute episodes, but Partin is humbled by the harsher realities of medical practice. Even with state-of-the-art technology—new ways of peering inside the human body, testing the blood, and decoding the genome—Partin and his team reach a diagnosis only about half the time. Since opening in September 2013, the Special Diagnostic Services clinic has seen 334 patients and resolved 173 cases. The most common diagnoses involve neurology, oncology, and rheumatology—enigmatic disorders of the nervous system, undetected cancers, or autoimmune conditions. Sometimes the diagnosis is definitive. A sleep study can identify sleep apnea as the cause of fatigue, headaches, and even cardiac problems. Other times, it’s a process of elimination. When every other possibility has been ruled out, doctors may decide that paralysis or loss of muscle coordination are symptoms of a functional neurological disorder—a physical condition triggered by emotional stress or past trauma. That’s not a diagnosis they can prove with a test. Partin always knew that solving undiagnosed cases would be difficult. To prepare for the opening of the clinic, he and his colleagues reviewed hundreds of case reports published by the New England Journal of Medicine.They perused the New York Times Magazine column, Diagnosis, by Dr. Lisa Sanders. And, yes, they even watched episodes of House. In the published reports, as in the fictional television series, doctors almost always found the causes. But the National Institutes of Health—which supports seven clinical sites in its Undiagnosed Diseases Network and focuses heavily on genomic sequencing—reports a success rate of only 27 percent. Barfield’s case is considered a “fever of unknown origin.” Medical studies report that such fevers are more likely to be caused by inflammation than an infection—for example, by an autoimmune disorder such as rheumatoid arthritis rather than a bacteria or virus. But in about a quarter to half of all cases, doctors never figure out the actual cause. Partin, like other diagnostic detectives, has to make peace with imperfection. Partin was about 18 years old when he encountered his first medical mystery, in the emergency room of DeKalb Medical Center. An earnest kid who grew up near North DeKalb Mall when the area was a burgeoning new suburb, Partin decided as a first grader that he wanted to become a doctor. He joined an Explorer post, a branch of the Boy Scouts, when he was 13 so he could volunteer at the hospital and eventually got a part-time job doing menial tasks as a medical assistant. Although he loved sports—soccer was a particular passion, and he played several positions on his high school football team—he was willing to miss the postgame pizza parties for a window into his future career. On Friday nights, he would race from the football field to the hospital and swap his bright green jersey for the mandatory white shirt, pants, and tennis shoes. He did whatever tasks the nurses and doctors threw his way, from cleaning blood or vomit off of patients to transporting them to radiology. One day, a patient came in with a depressed skull fracture. Partin took the patient’s blood pressure—which came out as 200 over 0. Thinking he must have done something wrong, Partin measured it again with the same result. “That’s Cushing’s reflex,” the neurosurgeon said. The next day, an ER doctor brought Partin a monograph that explained how the heart responds to swelling brain tissue by pumping blood to the brain, causing a rise in systolic blood pressure and a drop in diastolic pressure. Emory University has been Partin’s second home since his childhood, a place where he spent summer afternoons kicking balls on a field or wandering among museum mummies in the basement of the theology building. His father and namesake, W. Clyde Partin Sr., was the school’s beloved longtime athletic director, known on campus as “Doc.” (The nickname came from his PhD in education.) One claim to fame: Father and son were among the 110 runners in the first Peachtree Road Race. Partin ran track at Emory; his one-mile relay team held a school record that lasted at least a decade. That and other strong performances in track and soccer earned him a spot in the university’s Sports Hall of Fame (although Partin notes, self-deprecatingly, “Remember, this was Division III.”) Partin spent his entire adult life—college, medical school, residency, career—at Emory, except for six years as a physician in the U.S. Air Force. Once, when Partin was a medical student, a patient came into the ICU complaining of chest pain. The man didn’t look ill, and Partin wondered if he just had heartburn. Blood tests showed elevated cardiac enzymes—a sign of a heart attack. “Never be surprised,” Hurst warned him. As a student, Partin was also drawn to the humanities to balance out all the clinical calculations. He began reading about the history of medicine. He and another medical student convinced Dr. John Stone, an Emory cardiologist and well-known poet, to offer a course on literature and medicine. Stone gave voice to the delicate relationship between physicians and patients through his own poems and other works of literature, says Sally Wolff King, Woodruff Health Sciences Center historian. Wolff King, who taught in Emory’s English department, helped Stone develop his course. Stone died in 2008, but Partin carries on his legacy by coteaching the Literature and Medicine class with Wolff King. He writes poetry. And he listens acutely. Barfield is feeling worse, so he returns to the clinic three weeks later. This time, as he sits in the waiting room, he is shaking with chills. The clinic’s nurse navigator brings him a blanket and takes his temperature, which reaches 102.5. Since the last visit, Partin has been eliminating possible causes. He tried changing Barfield’s blood pressure medicine (sometimes fever is a side effect). He consulted with a radiologist about enlarged lymph nodes on Barfield’s scans but confirmed that there was no evidence of cancer. (Cancer can cause a fever, too.) Partin sends him to an infectious disease doctor, just in case. “I was reasonably certain that he did not have an infection,” Partin says. Still, nothing. After yet another week, Partin has a new idea and asks Barfield to return. By this visit, Barfield is teary-eyed and has a fever of 103.6, a cough, a headache, and a “funny sensation” in his eyes. But Partin sounded upbeat on the phone, so Barfield once again feels hopeful. Partin has a tentative diagnosis: polymyalgia rheumatica. The inflammatory disease mostly affects older adults, who typically wake with muscle aches. It sometimes occurs along with giant cell arteritis, another inflammatory disorder that causes fever and flu-like symptoms, again mostly in older adults. Partin weighs which of the two is most likely. Since both respond to steroids, he prescribes prednisone, a steroid that suppresses the immune system—and could actually make things worse if he’s wrong and Barfield has an infection after all. The next day, Partin sends Barfield to an ophthalmologist to have a segment of an artery removed from his temple and biopsied. Giant cell arteritis, also known as temporal arteritis, occurs when the immune system attacks the cells in the arteries, causing them to swell. The biopsy comes out negative for inflammation—but even a negative result doesn’t rule out arteritis. Partin sends Barfield to a rheumatologist. Dr. Athanasios Tiliakos deems it giant cell arteritis. What baffles Partin is the cough. “It didn’t seem to fit,” he says, since coughing isn’t a common symptom of either disease. But Tiliakos says that inflammation can affect blood vessels supplying the upper airway, creating an irritation that leads to a cough. Two days after starting the prednisone, Barfield’s fever disappears. Failing to properly diagnose is the original sin of medicine. Most people receive a delayed or incorrect diagnosis at some point in their lives, a 2015 National Academy of Medicine study concluded. One in 20 adults encounters the problem each year. A wrong diagnosis can come from ordering the wrong tests, misinterpreting the results, or overlooking an important sign. But sometimes, even the best doctors using the latest technology can’t unravel a complex set of symptoms. “There are things that haunt us,” Roberts says. Meanwhile, Dr. Doug Morris, a cardiologist who was then CEO of the Emory Clinic, was pondering Emory’s role as a referral center—not just for treatment but also for patients with undiagnosed diseases. As a leading academic medical center, Emory is involved in research and regularly interacts with physicians nationally and internationally. “There are strange illnesses that [physicians] see rarely,” says Morris, who is now associate vice chair of education in the Department of Medicine. The idea made its way to the Woodruff Leadership Academy, a kind of training program for leaders at Emory’s Woodruff Health Sciences Center. The O. Wayne Rollins family, longtime Emory philanthropists, had just given $5 million to establish an internal medicine clinic, which could help cover the cost. (While insurance pays for visits and tests, it doesn’t compensate for the extra time spent on the cases.) Partin agreed to take the lead and brought on other internists, including Roberts. Morris helped recruit key specialists who agreed to collaborate on referrals. Patients describe Debbie Cohen, the clinic’s nurse navigator, as the glue that holds the program together. She is meticulous, dogged, and devoted—qualities patients instinctively realize have often been missing from their prior medical encounters. “From the beginning, I tell them we’ll try very hard as a team to find a diagnosis,” she says. Cohen collects the patients’ prior records, schedules appointments and tests, and follows up—sometimes talking to a patient daily until a resolution is reached. She contacts each patient a year after their first visit to see how they’re doing, if the symptoms have subsided or recurred. Once a month, the team gathers over lunch in a small conference room, along with other nurses, specialists, and hospitalists. One internist shows a PowerPoint of a recent case—most often, a celebration of success. They present the symptoms, the patient history, the test results. They give their fellow physicians a chance to ponder what the mystery illness might be. His final slide shows two horses happily rolling in the dirt of their arena. “All in a day’s work,” Partin later says, laconically. Sam Barfield opens the gate of a loft that holds 17 pure white homing pigeons. They flutter to the edge and then fly skyward, until only downy white feathers float in the air. In his basement, he lays out a row of small trophies and medals—evidence of his recovery, as he is back to playing competitive disc golf and is now planning a tournament. His two-year-old grandson toddles through the door, and Barfield scoops him into his arms. It took a long time for Barfield to build back his strength. He still doesn’t feel quite the same as he did before the prolonged fever, but he isn’t complaining. Dr. W. Clyde Partin Jr.